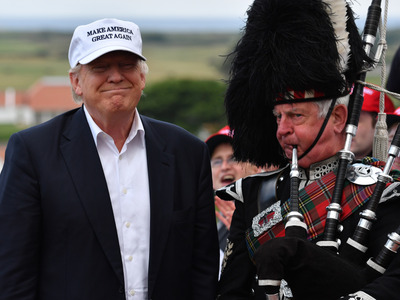 The presumptive GOP nominee weighed in on the UK’s decision to leave the EU, commonly known as “Brexit,” which passed in a contentious vote earlier in the day. Trump made that comment about his course as he celebrated the vote, noting what he perceived as parallels to his own presidential campaign. The Clinton aide continued that comparing running a golf course to running a country is another statement that “shows he doesn’t have a clue” about what it means to be president. “The American people need a steady hand at the wheel in a time of uncertainty and not a reckless and erratic egomaniac who could easily drive us off a cliff,” he said.